I looked with interest at the 3T NMI patch which i shal implement, but was most interested to read at the end of the article about using an 'external' counter to trigger the NMI just twice during SLOW mode, this would require more patching to ensure the alternate AF pair is loaded with $FF so that a single NMI will kick the Vsync or Video routines into action. Did anybody ever try this ? Andy Rea wrote: Did anybody ever try this ? Sorry, I don't know (I came later to the team in 2004). But maybe you could ask Peter (at Mahlerts)? Many thanks to Siggi and of course to Ludwig! What about the FP-patch, mentioned by the editor at the end of the article? Cool work as always Zsolt, i'm gonna give those roms a go in the Crazy 17.7Mhz Zeedy and see what results i get with CLCKFREQ. zsolt wrote: What about the FP-patch, mentioned by the editor at the end of the article? I have some idea, not proofed now but maybe you can think about. The CPU takes a HALT and wait for interrupt in SLOW display mode. But CPU does execute any instruction with bit 6 set, so could be used a RET instruction instead of HALT to jump back and continue program work till interrupt comes. This would add significant process time in slow mode with combination empty DFILE. So a CALL is needed instead of a JP (HL) and the address on stack to continue BASIC (or machine code) program. A CALL instead of a JP would add about 8 more cycles (=2 chars) and the RET about 12 more cycles (=3 chars). This trick would add instruction time of about 27 chars * 1,2 us = 32us per display line (empty screen). So in one frame could be added process time of about 6ms / frame which is about 30% faster. In fact the effect is more because the program can calculate in non displayed area till new line (HSYNC) which would add about 10us more, so effect could be up to 40%. No in true its more because you have to calculate to normal process time in slow mode. Should be double speed minimum. Maybe this would be a big patch but could give impressive speed in slow mode with some display output (okay full screen make no sense). So if somebody have time, this would be a great job. Erweiterung, die dem Interpreter die Zeilen-Sucherei abnimmt. QCOM2, die Voll-Version, die nicht ins 8KB-ROM passt. 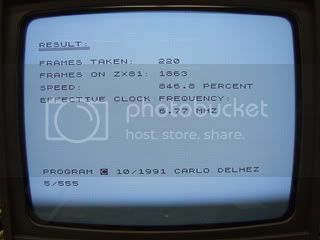 den Quelltext des ZX81-ROMs von Geoff Wearmouth benutzt. Der 3T-Patch ändert den NMI und gehört zur Kategorie Tips&Tricks. Der FP-Patch ändert Teile des RST 28H. etwas nicht funktioniert oder unverständlich ist. Could this be the fastest Zeddy Alive. Based very much on the uber Zeddy that is a modified issue 1 board, this one is built on protoboard, has a 40Mhz master Osc, which is divided by 2, for 20Mhxz, by 6 for 6.66Mhz (instead of 6.5) and divided by 12 for 3.25Mhz, it has 128K fast Sram (10 ns, but i reckon 35ns shoudl still work ) some extra logic for clock switching without Glitches. Gotta try the SG81 rom in it, and the Qcom patches, and recode the wait logic to include Wilf's wait mod... then this sucker will really rock. Only problem now is that the ay chips require a relatively long write pulse so i'm thinking i will add some auto-wait states for IO activity when running in turbo, this should have minimal impact since as your unlikely to be doing intensive io all the time.